Teddy bears taken to the next level of cute, with pastel colors and symbols on their chest (known as "tummy symbols" or more recently "belly badges"). They live up in the cloud-city of Care-a-Lot and frequently visit Earth to help out kids who are feeling down. The Bears have names relating to their speciality — Good Luck Bear, Friend Bear, and so forth. Later, "Care Bear Cousins" representing other animals were introduced (Brave Heart Lion, Cozy Heart Penguin, and more); they live in the Forest of Feelings about halfway between Earth and Care-a-Lot. The bears first appeared on American Greetings cards in 1981 (contemporary with Strawberry Shortcake). These little guys and gals were a hit right out of the gate when Kenner launched a toy line two years later. They had a lot of animated screentime for the rest of the decade: two specials, a TV series, and three theatrical films over 1985-87. The franchise died back through the 90's after a very brief and unsuccessful redesign; compare My Little Pony. The franchise returned after the turn of the millenium. In most of the films and cartoons, they are pitted against various "heartless" villains who want to make the world safe for evil, often by removing people's ability to care for others... or to feel emotions at all. The baddies ranged from the Mad Scientist Professor Coldheart in the specials and the DIC TV episodes to the Evil Spirit of the first movie to the Ineffectual Sympathetic Villain crew of the later Nelvana TV episodes (evil wizard No Heart, his niece Shreeky, and henchman Beastly). When the chips are down, that's when the Care-Bear Stare comes into play. They're one of the most spoofed of The '80s toy lines because of their overly sugary reputation — which is not wholly deserved when one takes some of their villains and plotlines into account. On the other hand, they're still quite popular. In 2000, the characters were relaunched with a toy revival and two direct-to-video animated films. In 2007, a redesigned line of the toys arrived along with another DTV film and a Saturday morning series on CBS, Care Bears: Adventures in Care-a-Lot. Adventures in Care-A-Lot is out of production, but the character line launched with the Oopsy Does It continued with films such as Share Bear Shines and The Giving Festival. On June 2, 2012, The Hub premiered a new series called Care Bears: Welcome to Care-a-Lot, which unfortunately ended up on the chopping board when The Hub changed hands to Discovery Family in October 2014. This possibly occurred because Hasbro neglected the franchise and ended up losing the master license rights to a company called Just Play.note Hasbro obtained the license in late 2007 along with Strawberry Shortcake, but it wasn't until 2012 that the show started airing, and it wasn't until mid-2013 that toys started appearing, which probably displeased American Greetings. However, Netflix commissioned a new show, Care Bears & Cousins. Initially announced for 2016, the show was rushed to production and premiered with six episodes in November 2015 instead. The series is in many ways a continuation of Welcome to Care-a-Lot. It features the same visual style and is clearly set in the same continuity, but adds the Care Bear Cousins and features a much larger role for the young cub character of Wonderheart Bear that was introduced in Welcome to Care-a-Lot. A new series subtitled Unlock the Magic is announced, confirmed to air on Cartoon Network and Boomerang in the United States and Pop in the UK, with the characters having an Animesque feel. An Aesop: Many installments of the franchise try to teach one of some sort. For example, the aesop of Big Wish Movie is that it's fun to wish for things, but it takes hard work and dedication to make dreams come true. Art Evolution: The designs for the Care Bears and Care Bear Cousins looked a bit different in there book appearances (Pre DIC and Nelvana) and there eyes were much smaller. Grizzle: Behold my power suit and quake in your boots. Oopsy: But, we don't wear boots. Bears Are Bad News: Well, at least from the villains' point of view. Beary Friendly: These bears are safe to cuddle. In fact, they want to spread good feelings! Beauty Equals Goodness: All the bears are cute and on the side of good. Be Careful What You Wish For: A major theme of the CGI Big Wish Movie. Wish Bear, upset that nobody likes her wishes, wishes for some bears to come to Care-a-Lot who like wishing just as much as she does. She gets her wish, but the new neighbors turn out to like wishing so much that they take away Twinkers, her wishing star, from her. The Bus Came Back: With the release of "Care Bears & Cousins" on Netflix in late 2015. 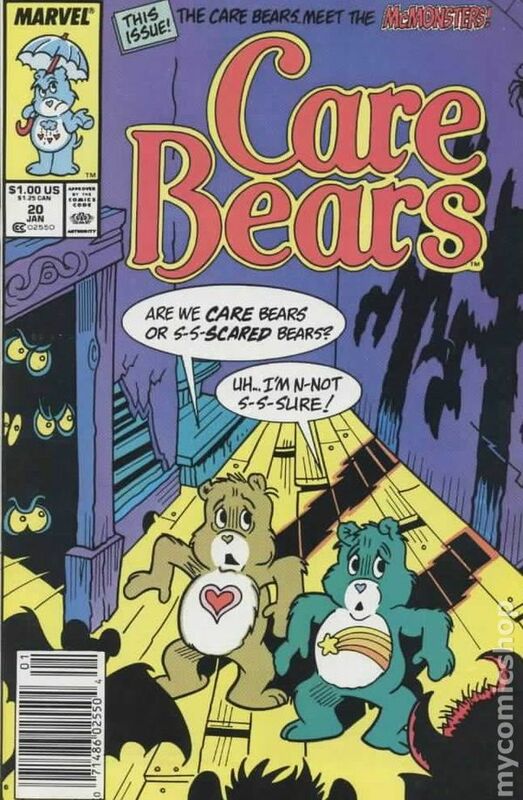 The title alone, means that the Care Bears Cousins will make a return to the franchise after their absence for almost 28 years (11-13 if you count the botched attempt by Play Along toys between 2003-2005). But Now I Must Go: In the 1980s Care Bears book The Trouble with Timothy, Friend Bear explains herself this way to Timothy. "I'm your friend, your snuggly, furry friend. In fact, that's my name, Friend Bear, and I come from the land of Care-a-lot. I'll be around as long as you need me, but when you don't need me so much, I'll be on my way." Oopsy Bear is constantly tripping and falling, plus he's the only bear without a Belly Badge. Captain Colorbeard: Captain Greybeard. He's not a bad guy, actually. Captain Ersatz: The Rat King in the Nutcracker special shares Beastly's voice and general characterization. Care-Bear Stare: Trope Namer. Taste the rainbow, biatch! Christmas Episode: A movie, Care Bears Nutcracker Suite. Chuck Cunningham Syndrome: The Care Bears Cousins haven't shown up as often as they we're back in the 80's. While the Cousins do show up rarely in the '00s revival, they haven't show up as often as they did back in the 80's. They didn't even get mentioned or acknowledged in the official Care Bears website. Also, Professor Coldheart and Frostbite up and vanished after the 80s series moved production from DiC to Nelvana; DiC created them, so they couldn't be used (and they weren't brought back when DiC regained the rights later on). Circle of Friendship: Care Bears love this move. Crying Wolf: Crying swamp monster, actually. Then there was a "real" swamp monster who happened to be Beastly in disguise, and the real real monster wasn't bad. Grumpy's fate during the '00s revival. He pretty much VANISHED from all merchandising from the show (despite being the most iconic of the group) in favor of Bedtime Bear, another blue-colored Care Bearnote He was actually spun into a clothing line, but it did not do well due to lack of publicity, and the fact that the clothing line had a theme that did not go down well with many folks. Eventually, the decision was reversed in Adventures in Care-a-Lot. Many characters got this treatment in the Nelvana series. Understandably, one of the base breakers in Care Bears: Adventures in Care-a-Lot is the demotion of Tenderheart Bear, the defacto leader of the Care Bears, to an extra, while Cheer Bear was promoted to leader in the series instead. Another related base breaker is the demotion of Good Luck Bear to background character, which led some fans to hate Oopsy Bear because they believed the latter to be the reason the former got demoted. The cousins got this big time in the '00s revival, where they would only be seen in books, some plush toys, and hardly got mentioned on the official website. They also were absent from Care Bears: Welcome to Care-a-Lot, Care Bears: Adventures in Care-a-Lot and the two CGI films. They finally made a proper return with a new Care Bears series, Care Bears & Cousins, in late 2015 on Netflix. Detect Evil / Holy Hand Grenade: Care Bears are essentially radar paladins. Wingnut, in the new Giving Festival Movie from the Adventures in Care-a-Lot era. And No-Heart in the Nelvana series. Willis: I don't believe it! Those girls made it, over a rainbow bridge! Considering how this "Rainbow Bridge" is getting young viewers who heard about this "pet afterlife" story confused... well... you get the idea. Drunk on Milk: One episode had Love-A-Lot drown her sorrows in hot chocolate after she thought Cheer forgot her birthday. Early Installment Weirdness: In the earlier days of the franchise (Mainly in the books made before the animated special and TV series were created) the Care Bears and Care Bear Cousins used to fly away back from a person's home and enter by a rainbow through a window before Cloud Cars were ever though of. This concept wasn't introduced to the franchise until the DIC animated series. The Care Bear Stare also wasn't used by the characters until the first animated special which introduced Professor Cold Heart. Easily Thwarted Alien Invasion: In an episode Adventures in Care A Lot, Gobblebug aliens invade Care A Lot. They only eat plants that aren't yellow. The Bears take advantage of it by turning every flower yellow, so the Gobblebugs leave. Everything's Better with Rainbows: Rainbows are everywhere. They're not just for decoration, they're used as traveling devices, energy and hell, even weapons. Especially with Cheer Bear. Everything's Better with Sparkles: The princess of Wonderland uses sparkles to revive withered plants. Evil Is Hammy: Most of the villains. Probably the most notable example is the Vizier from the Nutcracker special, who is fond of SHOUTING OUT EVERY LINE! Which are then commonly followed up with a "MUAHAHAHAHAHAHA!" If you don't think the Evil Spirit counts, perhaps you need a LESSON on what Hammy is. A LESSON you really need. A LESSON FOR YOU!!! No Heart chomps on practically every scene he's in, bellowing his lines with hammy fury. Particularly, "BEASTLYYYYYYYY!!!!!!!!!" Evil Redhead: Dark Heart's human form. Exactly What It Says on the Tin: Most of the Bears' names in relation to their personalities and talents. Fluffy Cloud Heaven: Care-A-Lot, just not as an afterlife. For the Evulz: Pretty much the only reason almost any villain does anything. Except for Adventures in Care-a-Lot's Grizzle, who simply hates the Care Bears and wishes to take over, or at least be rid of, Care-a-Lot. Another exception is the Wizard of Wonderland from the third movie Care Bears Adventure In Wonderland. His motive is political power (he wants to become the new king of Wonderland). Beastly in the new Welcome to Care-a-Lot series isn't really evil and only makes mischief that he considers to be fun. Four-Fingered Hands: Most of the human characters and bears. Shreeky. Oddly, other human characters, including her uncle No Heart, have all five fingers. Maybe there's a story there. Just watch Nutcracker Suite. Count how many fingers Alan Prince/Nutcracker, his wife and their students have. Getting Smilies Painted on Your Soul: The Care Bear Stare had this effect in the DiC, to somewhat disturbing results. It was toned back into an all purpose weapon against evil in the Nelvana series before returning to its roots in Adventures In Care-A-Lot. Green Lantern Ring: The Care Bear Stare can generate energy constructs, generate light, fabricate items, act as a prosaic energy blast, brainwash people into caring, free people from brainwashing, damage intangible entities, and shove objects around telekinetically, among other things. 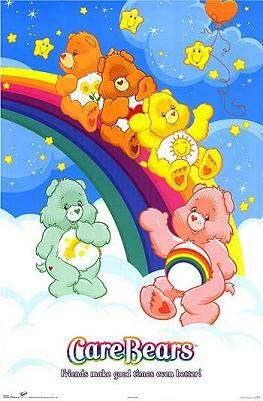 The Good Guys Always Win: The Care Bears never lose in any episode of any of the animated series or in the movies. Harmless Villain: Most of the villains who aren't this from the beginning degrade into one over time. Heart Is an Awesome Power: In the end, everything can be solved with a Care-Bear Stare or a quick pep talk. Heavy Sleeper: Bedtime Bear in Adventures in Care-a-Lot. Wakes up, mumbles a short sentence, drops back off to sleep. Hold Up Your Score: In "Stand Up And Cheer", the judges at a talent show hold up cards with either a storm cloud or a heart on them. Intercontinuity Crossover: Sanrio and the Care Bears once teamed up with their characters Kiki and Lala from Little Twin Stars in early 2014 called "Kiki and Lala X Care Bears" ◊ . Both got their own exhibit as well as exclusive merchandise from both of them . Which is fitting unlike the last time they did a crossover back in 1985 ◊ Unfortunately it's only in Japan. In the Doldrums: There's an episode like this, called "Drab City," where the titular bears find a town where everything is depressing and colorless, and all the people are apathetic. As they travel through the town, they begin to turn gray and depressed as well. I Would Say If I Could Say: Grizzle accidentally kisses his robot minion UR2, to which the latter disgustedly states that he's sick to his stomach even though he lacks a stomach. Jerk with a Heart of Gold: Grumpy Bear. Large Ham: The voice actors and actresses playing the villains had a lot of fun. Averted in the 80s: One was planned for the Atari 2600, but was scrapped when the great crash came around. For the 2000s revival: One for the Game Boy Advance and One for the V-Tech V-Smile. And three for PC/Macs. For the 2007 redesign: One for the V-Tech V-Smile Baby Infant Development System. Edutainment Games: The V-Tech V-Smile and V-Smile Baby titles are this. Lighter and Softer: Adventures In Care-A-Lot manages to be this, even compared to the older cartoons. Welcome to Care-a-Lot takes it Up to Eleven. In fact, the entire line from the 2000s onward is generally this. Any villains still around are generally either of the bumbling type or truly Not Evil, Just Misunderstood. Also, some of the 1980s books tend to be rather light and soft compared to some of went on in the TV series and generally feature the bears simply speaking honestly and helpfully to help human kids with real-life problems. Loads and Loads of Characters: Almost inevitable, given how many different versions there have been. The CGI Welcome to Care-a-Lot series seems to use pretty much every Care Bear that isn't part of the main cast or Chucked out of the series as either a background character or in a minor role. Love Redeems: Or caring redeems, but Dark Heart became Christy's friend in the second movie, and he felt so bad about nearly killing her, that it drove the evil out of him. Merchandise-Driven: The first two films introduced new or revamped characters in conjunction with their toy line debuts: the Cousins in the first, and the whole gang's baby selves in the second. There are plush toys for bears from Adventures in Care-a-Lot that had maybe two lines on the show at most, if they even got to speak at all. Inverted with Tenderheart Bear in the Adventures in Care-a-Lot era. You'll be hard pressed to find plush forms of the character. They didn't even make a beanie plush of Tenderheart, and they have beanie plushes of the other Care Bears! Minion with an F in Evil: Beastly from the series; the similar Tweedles from the third movie. Monochrome to Color: The Care Bears once found themselves in a place called Drab City, a dull, gray place where something is draining the life (and color) out of the citizens, leaving them uncaring and apathetic. As the Care Bears spend more time, there, they begin to be affected by it as well, until they finally find the cause, some kind of strange meteor. Once they get rid of it, the color instantly returns along with all the life and feelings. Well, of course, but Adventure in Wonderland actually goes so far as to show us the inside of Grumpy Bear's bathroom, which has everything you would expect except for a toilet. No wonder he's so cranky. Even in the second movie's "I Care For You" song, all the diapers they changed seemed perfectly clean. One-Winged Angel: In Care Bears 2: The Next Generation, Dark Heart turns into a big ol' heap of Super Smoke. Pie in the Face: In Journey to Joke-a-Lot, the pie-in-the-face is one of the funny things that Funshine Bear sings about in the song "Make 'Em Laugh." Funshine: A pie in your face / A banana in your ear / Pull a chicken from your hat / And make him disappear. The Power of Friendship: Yup. The Power of Love: Uh-huh. Power-Strain Blackout: The Care Bear Stare is usually portrayed as being highly fatiguing, with extensive or particularly powerful uses causing the bears to collapse from exhaustion. Princesses Rule: Princess Starglo, who is the "mother of all stars", yet is not a queen. Real Dreams Are Weirder: In the Adventures in Care-A-Lot TV series, all the Care Bears share a dreamspace where they tend to have rather mundane dreams (where they do the same things they tend to do in their waking lives), so it was rather refreshing to see the bears having more dream-like dreams in the Share Bear Shines movie. Recycled INSPACE: One of the oddest examples this side of Fonzie and the Happy Days Gang. The final season of the original "Care Bears Family" cartoon featured two spinoffs. One was a Recycled IN SPACE Star Trek parody. The other was a Recycled In Prehistoria Clan of the Cave Bear parody. This, friends, is what a Dork Age looks like and the cartoon was canceled soon after. Short Runner: While the franchise itself has a run of over 30 years of age, Certain incarnations of the franchise, notably Care Bears: Adventures in Care-a-Lot and Care Bears: Welcome to Care-a-Lot, are this due to Executive Meddling. Shout-Out: In Journey to Joke-A-Lot, the computer calling Funnybone "Dave" becomes even funnier when you realize it's a reference to 2001: A Space Odyssey. PAL: I'm afraid I can't do that, Dave. Funnybone: Stop calling me Dave! Also, one of the episodes is called 'The Turnabout'. Sliding Scale of Idealism vs. Cynicism: Take a good guess on which side this show lies on. Solid Clouds: Care-A-Lot is a land of clouds that are solid enough to stand on, but soft enough to poke one's head through to observe the world below. Standardized Leader: Tenderheart Bear is often written as the most generic. The Stars Are Going Out: Princess Starglo turns them all off in Share Bear Shines Movie because without people wishing on stars and believing in her, they just don't have any power, anymore. Also earlier, a Nelvana episode where the baddie Stratonefarious is stealing and bottling stars to light up his stormcloud so he can see his sheet music. Sugar Bowl: They live on clouds in an ever happy and sunny world. Swiss Army Tears: They save Wish Bear from (basically) brainwashing in one episode. Tertiary Sexual Characteristics: Girls are usually pink or purple. That Makes Me Feel Angry: Somewhat justified because the Care Bears are all about getting people to "share their feelings." It's heavily Flanderized in Adventures In Care-A-Lot, though, where the Bears (particularly Share) constantly inform each other just what emotion they're feeling at the time. The "Nothing's Going Right" song is probably the ultimate example of this. "I'm mad, I'm so mad / And I'm frustrated, too... Do you know what I mean when I say nothing's going right for me today?" Taken Up to Eleven in Welcome to Care-a-Lot where the Care Bears don't even bother to hide when they're annoyed with one another. In one particular episode, Share Bear messed up a special drink, causing the other bears' fur to change colours and patterns. the resident Diva, Harmony Bear, instantly throws "THIS IS ALL YOUR FAULT!" at her. Wonderheart, within the same series, is brutally honest with her feelings. this is actually a very useful aesop for young children. Theme Music Power-Up: The Giving Festival Movie — "Care Power On"
Thing-O-Meter: The Caring Meter, as if it could be anything else. Tome of Eldritch Lore: In the first movie, and it was alive. Unwanted Glasses Plot: A boy refused to wear his glasses because other kids told him cowboys didn't wear glasses. Vile Villain, Saccharine Show: The DiC and Nelvana TV series and movies are these. Villainous Friendship : Dark Heart and Christy in the second movie. In the first TV special: "Allow me to introduce myself!/They call me Professor Coldheart..."
And from the Adventures in Care-a-Lot movie Oopsy Does It, "Grizzle's Bad." "When I'm the King of Wonderland" in the Wonderland movie. Wasn't That Fun? : In one segment from the "Giving Festival" movie, Oopsy and Wingnut help Trueheart get over her fear of rollercoasters. Part of their method involves riding the ferris wheel first, but they accidentally set the wheel to super fast, sending the wheel spinning at at a terrifying pace. Once they get it stopped, Trueheart seems to be in shock, until she says, "That. Was. AWESOME!" Later, after Trueheart gets over her fear of the Funderbolt, she completely embodies this trope, insisting on continuing to ride after the others have been tired out from riding twenty times. Why Don't You Just Shoot Him? : No Heart was rather miffed with Doctor Fright's tendency to toy with his victims instead of just finishing them quickly. Arguably justified, as Doctor Fright at least claimed to feed on people's fear. Zombie Apocalypse: Adventures in Care-A-Lot has one when a Love Potion goes wrong, turning the other Care Bears into creepy "love zombies" bent on apparently hugging Oopsy to death.